Overview: In this lesson, students will demonstrate an understanding of identity through photography, famous portraits, and photographing themselves. What is a self-portrait? How do artists communicate their identity through self-portraits? How can a self-portrait express your identity? How is your identity different from your best friend? How does peer pressure affect your identity? Of all the pictures you have of yourself, which do you like the best and why? What does that picture remind you of and why? How do photographs of you show your identity? FA 1: process and techniques for the production, exhibition or performance of one or more of the visual or performed arts. 1) Students will analyze identity by comparing and contrasting the work of Sherman and van Gogh. 2) Students will explain how their identity is different from their friends. 3) Students will interpret their own identity through photographing themselves. 4) Students will design a self-portrait and describe how it displays their identity. To grab the interest of the student, the teacher will introduce the lesson by allowing students to experiment with a variety of cameras from one hundred years old to digital. A brief history of photography and the handout "Ten Tips for Better Photos" will be discussed. 1) After discussion of identity through photography, students will analyze and interpret self-portraits of Vincent van Gogh and photographs by Cindy Sherman. Emphasis on interpretation of the identity of the person in the portrait will be discussed. 2) Students will work in a group of three or four to create a venn diagram, comparing and contrasting the artwork of van Gogh and Sherman. 3) On their own, students will journal personal responses to: Who am I? What are my strongest traits and characteristics? How do I think others see me? How do I hope others see me? Who do I want to be? What career is in my future? Who has most influenced my life and why? How do I want to be remembered? Once discussion and journaling is complete, students will photograph themselves to create a unique self-portrait. Students will be encouraged to use props, a variety of viewpoints and angles, as well as photographing their hands, feet, face, and/or objects that best represent them. 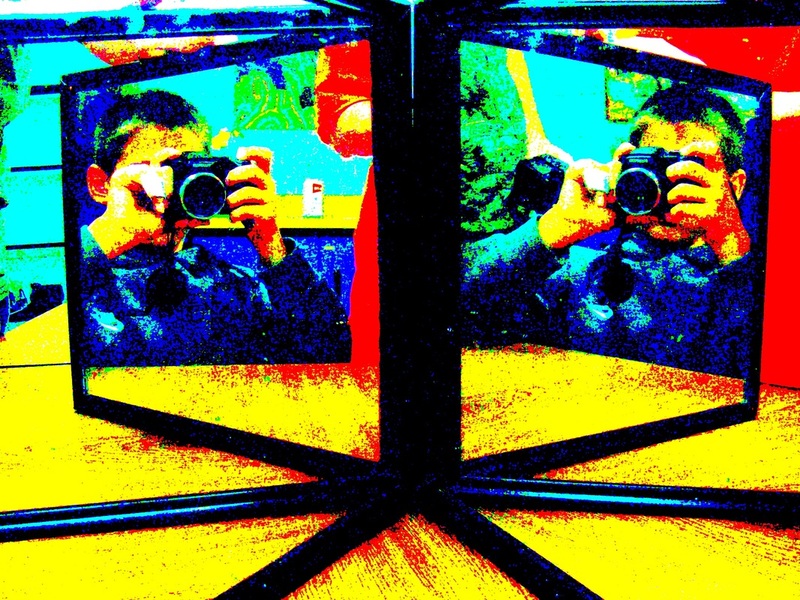 Students will select their favorite self-portrait from their collection of photographs and edit, as well as add text if desired, on www.picnik.com Those students familiar and experienced in "picnik" will use photoshop. Discussion and inquiry of topic, checklist of expectations (excellent behavior, work habits, and maturity of camera use, care and pride in work, and creativity in representation of identity in a final photograph), group venn diagram contains at least 3 different responses in each area, and personal journaling answers to each question. Self-portrait through Photography by Trey (2011). Student explanation: "I wish there was more than one of me so I could get everything done that I need to do!" Self-Portrait through Photography by Jaydra (2011). Student explanation: "You only live life once, so relax and enjoy it!"